Though naming a male cat Mog or Puss or any other non-descriptive name is easy, you should take some time and examine their behavior before naming him. If your cat is a fighter or a warrior something like scrapper or Ali will be awesome. There are hundreds of good male cat names out there to choose from. 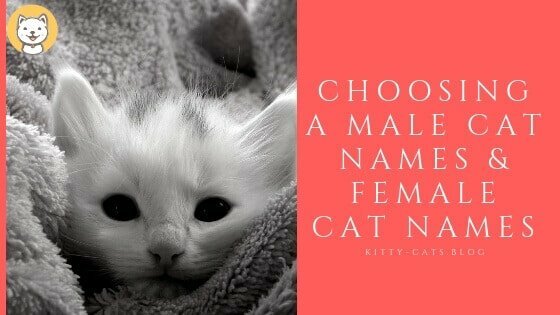 You may choose from boy names inspired by historical figures, celebrities, and the feisty characters around the world of cats. You can also find some unique and clever male names, derived from literature and pop culture that includes cultural traditions and interesting languages. Regardless of your style, you are certain to find a male cat name that perfectly suited your feline friend. Choosing names for cats is not an easy process and may take some time. Make a list of your 20 favorite male cat names, and then watch your cat for some days; over time, you will be able to narrow down the list until you get the right name for your male cat. Finding the perfect male cat names can be a lot of fun! There are a few things you should keep in mind. When naming your cat, if it’s a kitten, it is likely that the cat doesn’t have a name. If you adopt an adult cat from the shelter, they may have been given a name from the shelter. The following are some cool name you can give to your male cat. Caspar: This is spelled like the name of a ghost in the 1990s movie. If you have a white male kitten, this would be a remarkable name for cats. Folks usually relate ghosts with being white; therefore this is a nice name for a white kitten. Alexander: This is a wonderful name for an older adopted cat. Although a lot of people bear this name throughout history, it is one of those names that can be associated with a cat. Shaggy: This is another great name for a male cat. If you have a long haired male cat, this is a great name for your feline friend and it would perfectly fit a Persian kitty. However, if you adopt a cat that does not have long hair, then you perhaps should not name your cat shaggy. Happy: This is a great name for a happy male kitten! If your kitten is friendly playful and lovable, then this name might fit him well. This is one of the coolest male cat’s names. Morgan: This name can be given to either male or female kitten; hence it does not sound like a conventional name. Personally, I believe that gender-neutral names make amazing names for cats. You can also consider the following list of suggestions for male cats. Names like Astro, Atticus, Balto, Benz, Blake, Bourbon, Buzby, Capone, Chapli, Damian, Daunte, Einstein, Everest, Expresso, Forbes, Gabriel Loopy, Maniac, and Meriwether etc. Although this article focuses on the male cat names, it would be really unfair to end the article without mentioning female cat names. Female cat names are not hard to find, but a good female cat name can be elusive! So check out the following female cat names. Sassy: This is among the most popular cat names. It is of French origin, it means a beautiful girl. It is the perfect choice name for pretty beautiful cats. Precious: This is of Latin origin and it means virtue, although most people named their new feline friend this because they are lovely. Maggie: This is of Greek origin and means Pearl. Another great name for a very special pet, this name has been among the best cat name choice for years. Lily: This cat name means flower and is also of Greek origin. Lily is closely by Lucy, which is of French origin and it means light. Coco: This female cat name means coconut of Spanish origin, although most people chose this name because of their cat dark coat in relation to cocoa beans. Naming your male cat is a serious matter, unlike the common belief. It is not something you can do at the last minute or emotionally, it is a complex exercise that should be done with the greatest diligence. Remember that proper planning prevents poor performance! Make an effort to name your new cat as you will do with naming a new baby … This is a very important activity, be sure you treat it that way. Your cat will be grateful for it.